The Jordan Son of Mars failed to reach expectations when it was released in “Bordeaux” colorway, but Jordan Brand is looking to bounce back with the release of a popular colorway of the sneaker. The Jordan Son of Mars will be coming out soon in Black/Red colorway, which is often described as the Chicago Bulls colorways for it bears the team colors of Michael Jordan’s former squad. 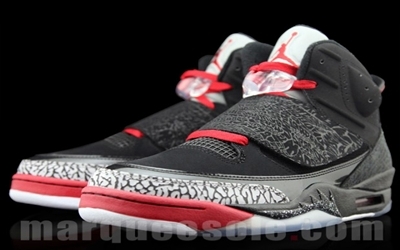 The shoe features a black upper with red touches and the cement print remains on its original position. This will come out anytime soon so watch out for it!